Hudson River Park is a waterside park on the Hudson River that extends from 59th Street south to Battery Park in the New York City borough of Manhattan. Bicycle and pedestrian paths, including the Manhattan Waterfront Greenway, span the park north to south, opening up the waterfront for recreational use. 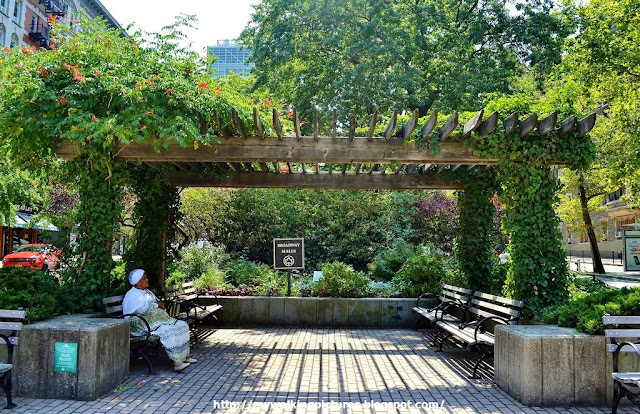 I started my walk at Clinton Cove, a small park named for former New York governor Dewitt Clinton. The park includes green lawns for picnicking, a boathouse holding canoes and kayaks and a giant bottle, Malcolm Cochran's Private Passage. 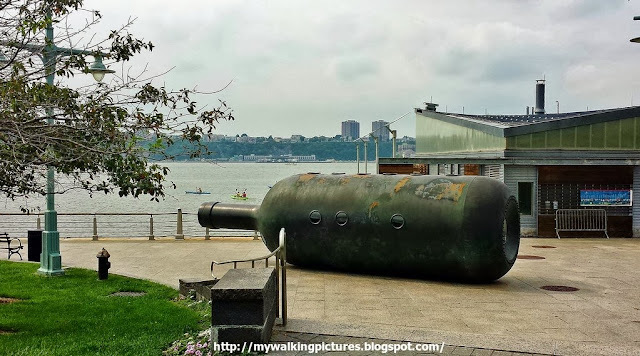 Created by artist Malcolm Cochran, Private Passage is a distinctive sculpture consisting of a 30’ x 8’6” wine bottle resting on its side, within which is a representation of an interior stateroom from the ocean liner, Queen Mary. The exterior of the bottle is fabricated of bronze and zinc with a traditional green patina. 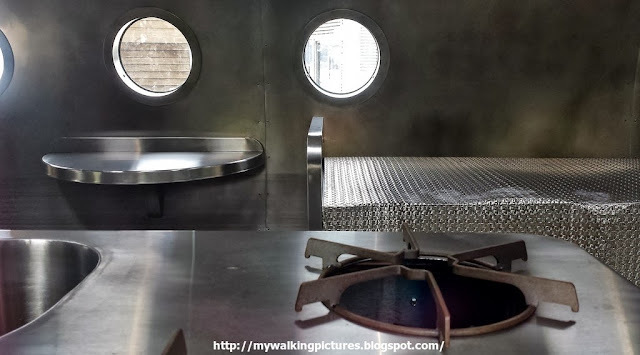 Looking through one of the portholes, this is what I saw. A bed fashioned from sheet metal, as well as a stove. You can also view the interior through the larger circular windows in the mouth and bottom of the bottle. There's even a lavatory, it's a complete room inside a wine bottle. Clinton Cove is also home to The Downtown Boathouse in Pier 96, which offers free kayaking lessons on weekends from mid-May to mid-October. There's still time for some lessons, if you're interested. You can learn more about this in the boathouse's FAQ page. 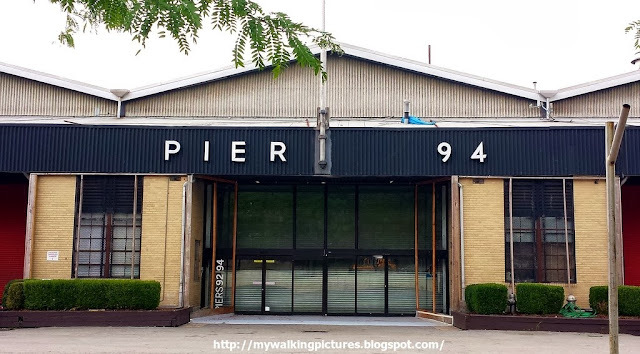 Pier 94 was closed when I passed by, it has been converted to a special event venue to host shows. Piers 92/94 is home to design oriented events such as The Armory Show, Architectural Digest Home Design Show, The Pier Antiques Show and leading fashion shows during New York Fashion Week. The facility also regularly host parties and product launch events for groups ranging in size from small charitable foundations to Fortune 500 companies. 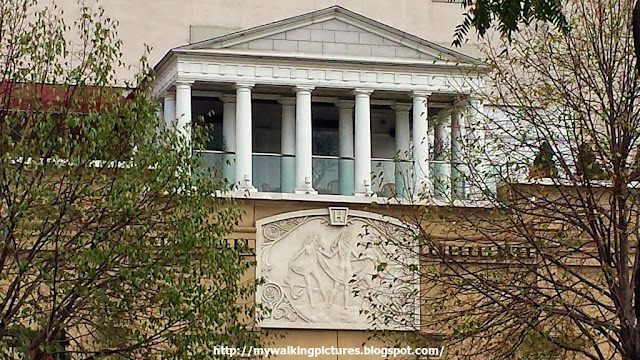 Looking across the highway, I saw a structure with doric columns sporting a big H. It is the gentleman's club Larry Flynt's Hustler. 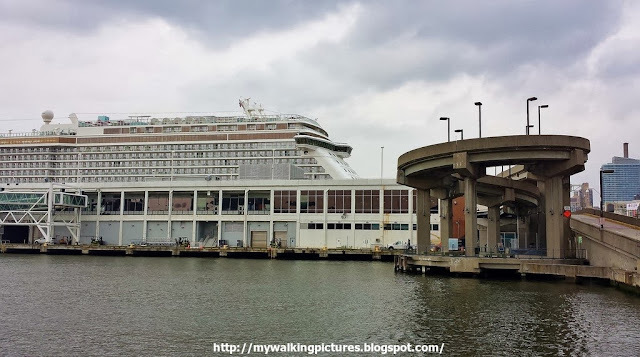 A little bit further, I saw a colorful big ship which turned out to be the Norwegian Breakaway, the world's fifth largest cruise ship. She had her maiden voyage on May 2013. Norwegian Breakaway is home ported at the New York Passenger Ship Terminal in Manhattan, making seven-night cruises to Bermuda (May thru Sept) and seven-night cruises to the Bahamas & Florida (October thru April). She is the largest cruise ship homeported year-round from New York City. The New York Passenger Ship Terminal consists of Piers 88, 90, 92 and 94 on the Hudson River between West 46th and West 54th Street. Ships now dock at Piers 88, 90 and 92 while Pier 94, as I mentioned above, is now used for exhibition space. In 2003, the terminal handled 900,000 passengers, and the city is forecasting that 1.5 million will use the terminal by 2017. This was Pier 92 when I passed by. The West Side Highway takes a small jog east from the piers to below West 42nd Street because when the terminal was built land had to be taken away from Manhattan to allow for longer piers. The US Army Corps of Engineers, who control the waterfront dimension, would not extend the pierhead line farther into the river, so the city extended the pier by cutting away at the land. 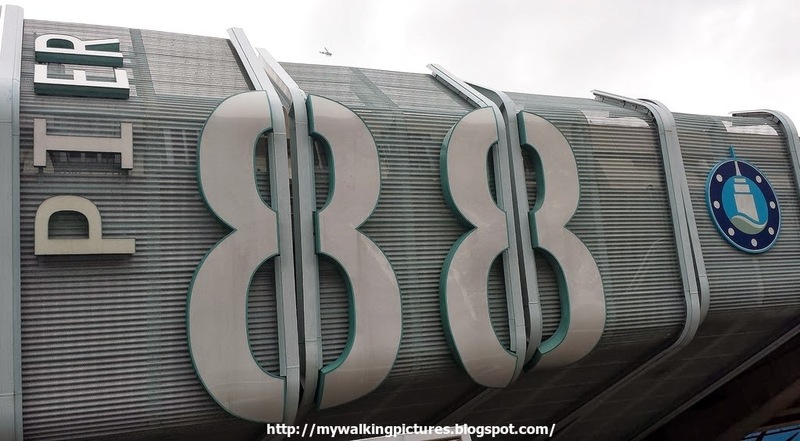 The overhead design for Pier 88. 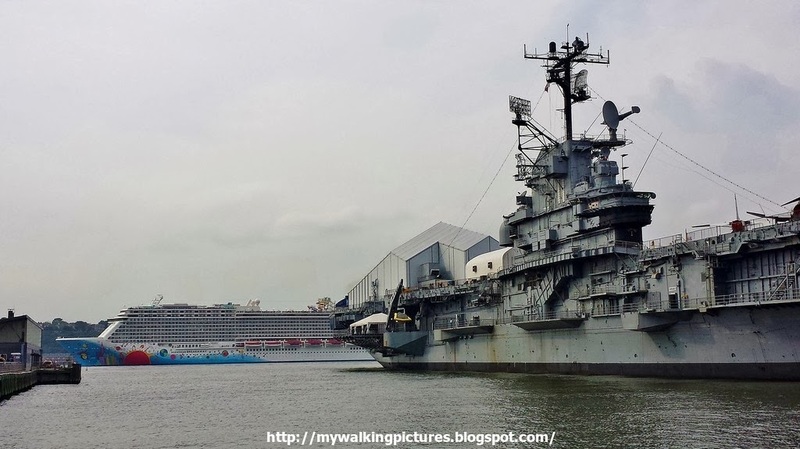 Next to Pier 88 is Pier 86, once used by United States Lines, it is now home to the USS Intrepid. 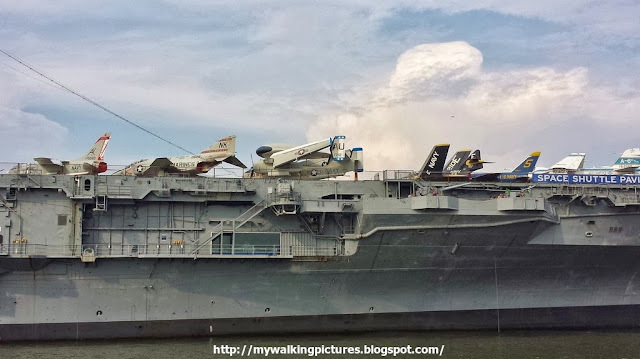 The aircraft carrier has been decommissioned and turned into a museum ship. 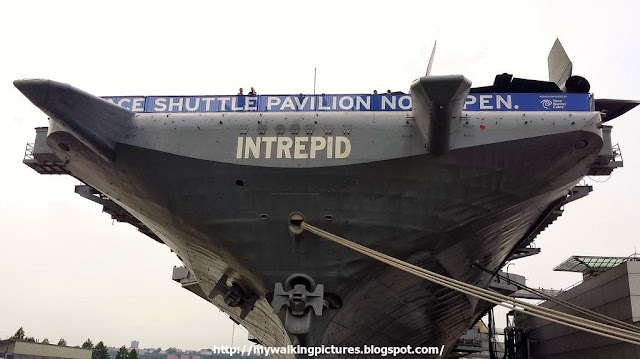 Plans originally called for Intrepid to be scrapped after decommissioning, but a campaign led by real estate developer Zachary Fisher and the Intrepid Museum Foundation saved the carrier, and established it as a museum ship. In August 1982, the ship opened in New York City as the Intrepid Sea-Air-Space Museum. Four years later, Intrepid was officially designated as a National Historic Landmark. At the northern part of the pier lies the submarine Growler, the only American diesel-powered strategic missile submarine open to the public. 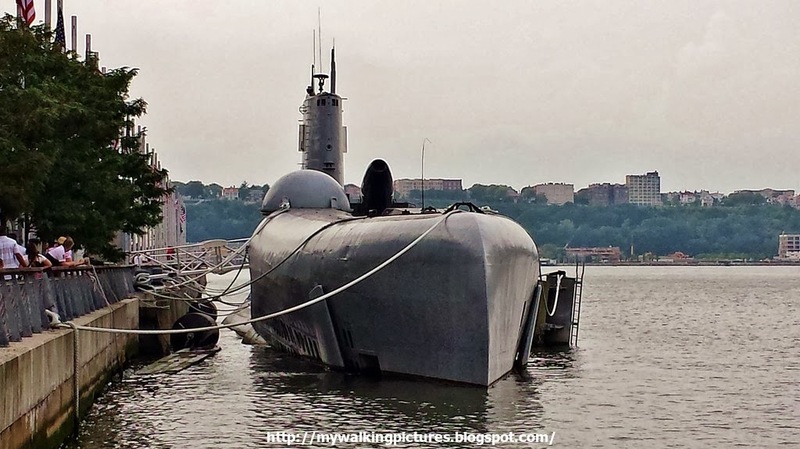 It offers museum visitors a firsthand look at life aboard a submarine and a close-up inspection of the once "top-secret" missile command center. 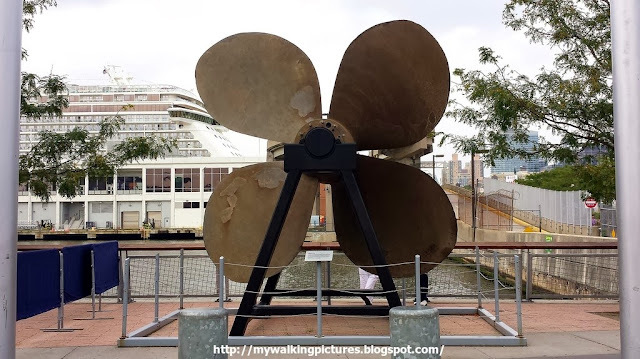 Near the entrance to the museum is one of the aircraft carrier's four propellers. It weighs approximately 27,000 lbs or the equivalent of ten automobiles. Looking back at Pier 88, I could see what looks like a ramp. 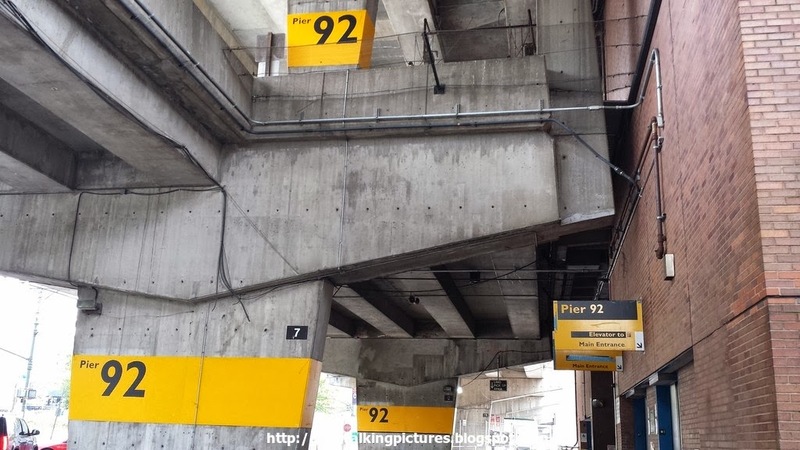 I'm guessing this is the automobile ramp for the open rooftop parking at Pier 92. This is the front side of the museum facing the West Side Highway. There is a sign that says Space Shuttle Pavilion Now Open. This refers to the space shuttle Enterprise which went on public display last year but sustained damages from Hurricane Sandy. The exhibit reopened just last July. The Intrepid is so big it could hardly fit in the camera screen. 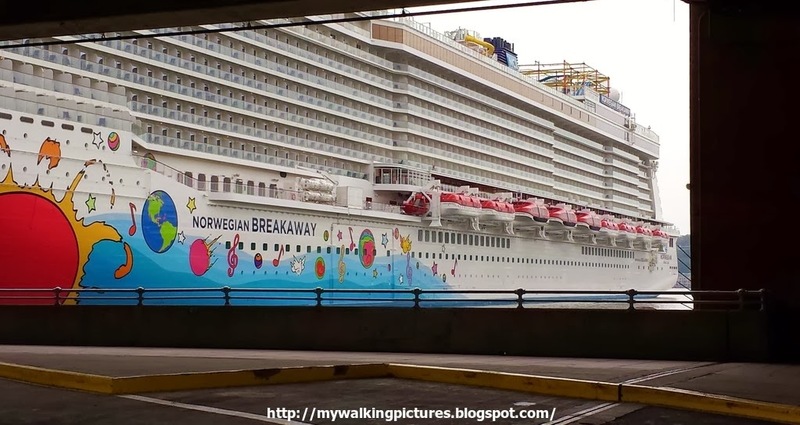 On the pic below the 18-deck Norwegian Breakaway sails behind the carrier. 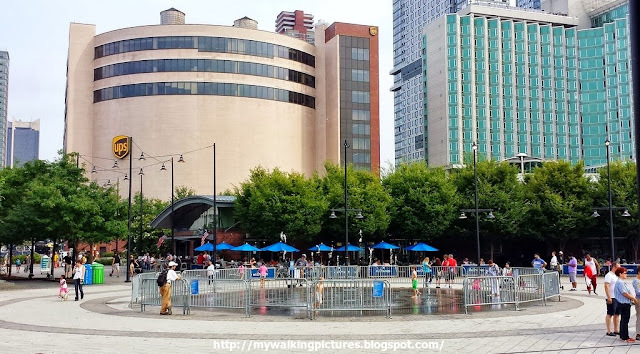 Adjacent to Pier 86 is Pier 84, the largest public pier in Hudson River Park. There was an enclosed water feature for kids to play around. Near this is an interactive science-themed playspace where you could pump water to make sculptures spin, and raise and lower sluice gates to operate a miniature canal. However, there was no water when I was there and I saw some kids trying to coax something out of the pumps. I'm sure this is one enjoyable part of the park when it is in use. Pier 84 also has great views of the various aircrafts on exhibit at the Intrepid Sea-Air-Space museum. 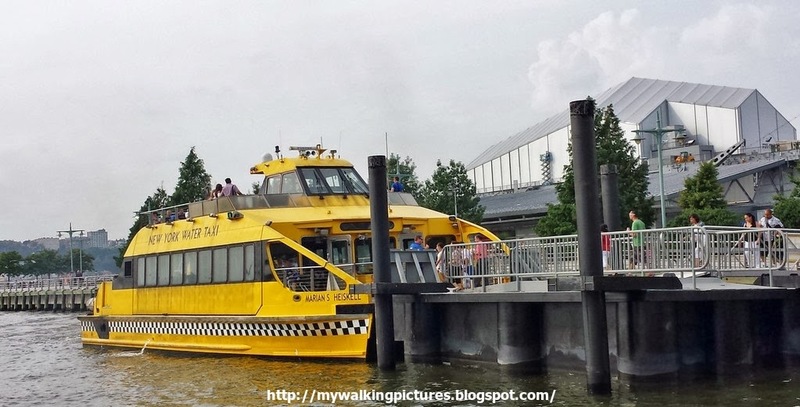 The pier is also home to the New York Water Taxi terminal. 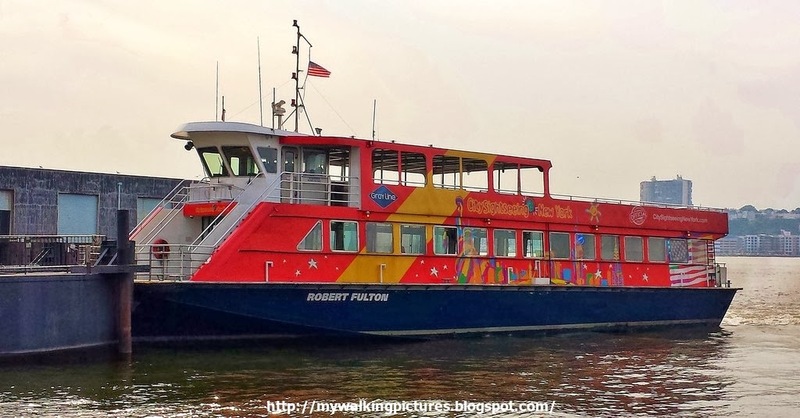 The company offers water borne transportation, sightseeing tours, and private event charters. Pier 83 is the Circle Line terminal, New York’s oldest and largest provider of scheduled and chartered sightseeing and special event cruises. Pier 79 is a modern building opened in 2005. The West Midtown Ferry Terminal serves ferries along the Hudson River in New York City and northeastern New Jersey. Midtown west looks great when viewed from the ferry terminal. 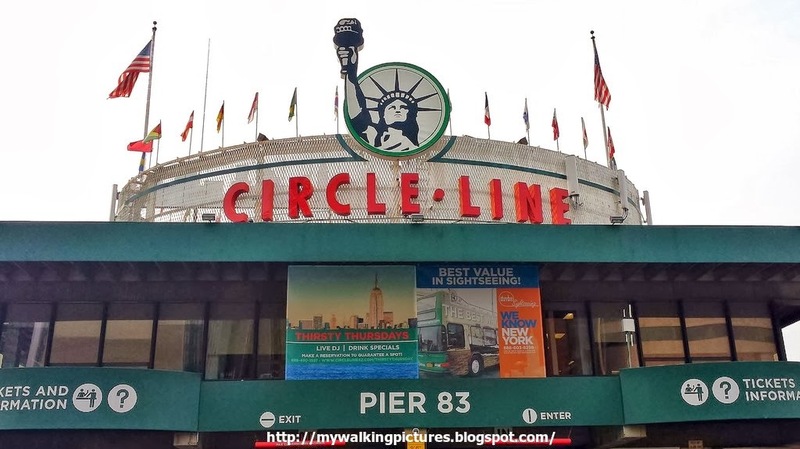 Pier 78 is the terminal for Gray Lines which also offers sightseeing cruises. 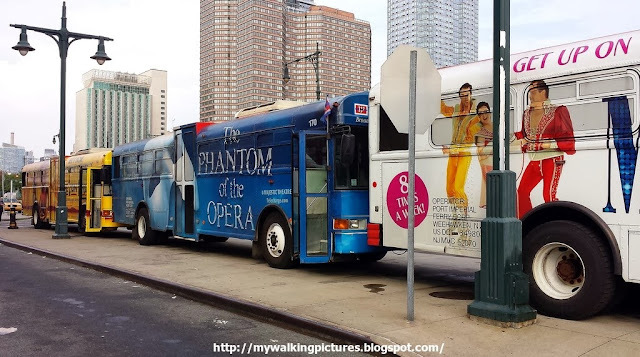 The buses which ferry people to these cruise ship terminals are parked near the piers. They are a moving advertisement for the various shows on Broadway. 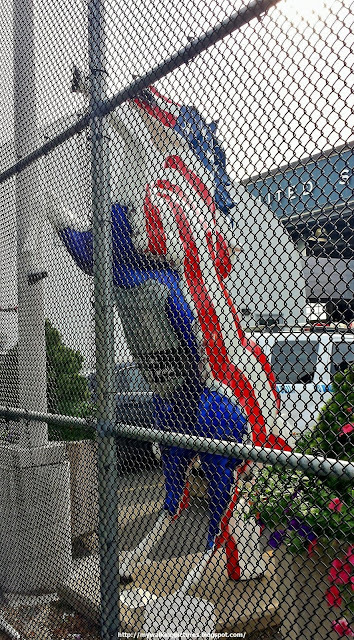 Pier 76 currently serves as a tow pound operated by the New York City Police Department. 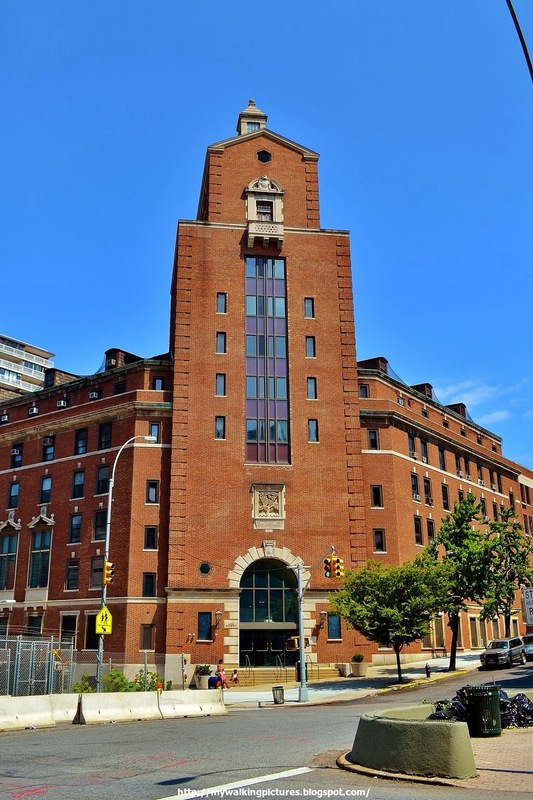 It also houses the headquarters of the NYPD Mounted Unit. Near the fence of the compound is a statue of a horse standing on its hind legs, painted in the colors of the US flag. 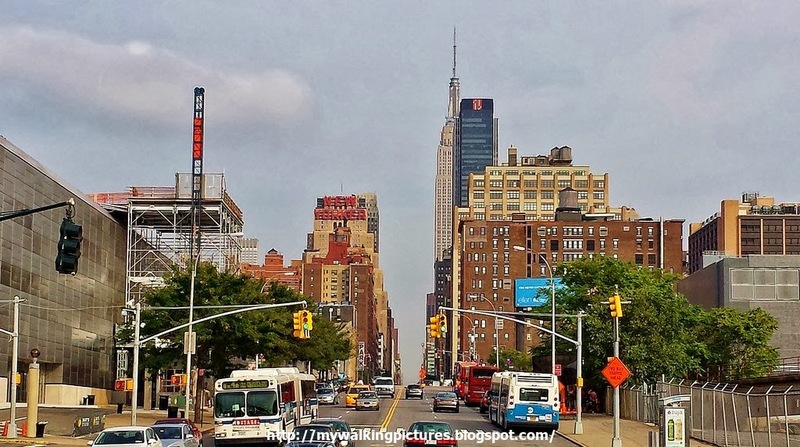 By the time I reached 34th Street it was nearly 5 pm and I had a previous commitment to go to so I hurriedly snapped a quick pic of 34th Street from 12th Avenue before leaving the West Side Highway. 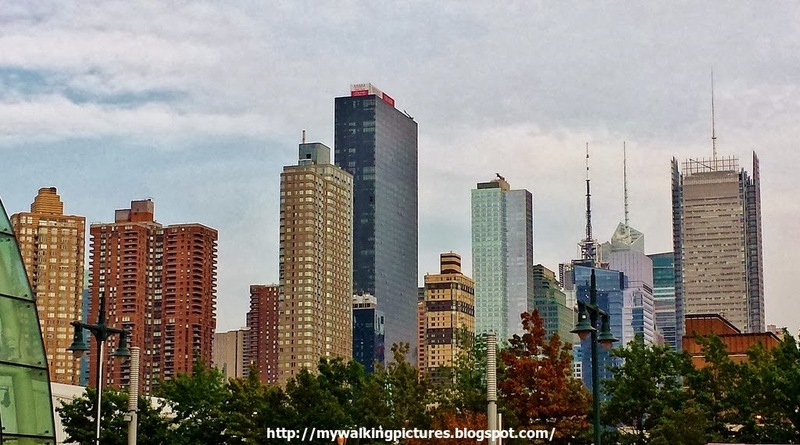 Hopefully in the near future I'll come back and resume my walk along the West Side Highway, this time from 34th Street going south. 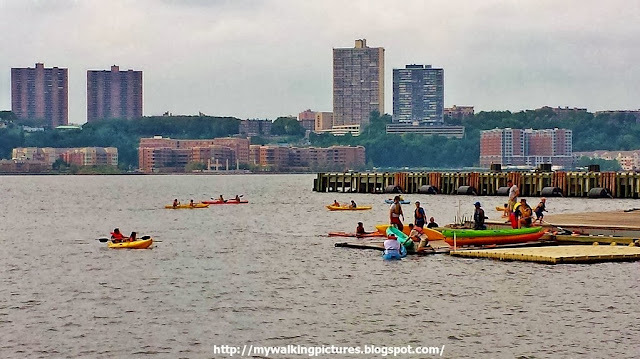 A couple of months ago, I had the opportunity to sail on the Hudson River aboard the fireboat the John J Harvey and took pictures of these piers as viewed from the river. I have long wanted to walk the length of Broadway in just a day but I don't think I can do it as I tend to stop and take a lot of pics, and sometimes make detours when I see something interesting on a side street. So what I do is walk its length in stages. 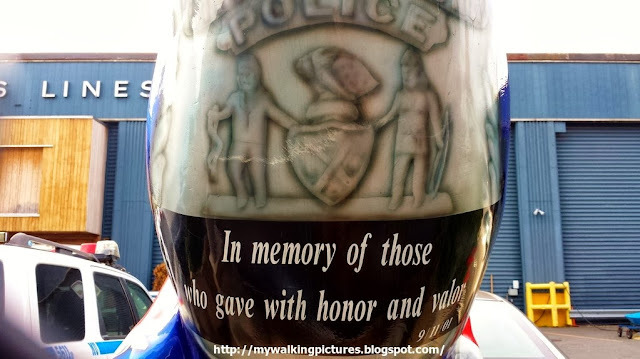 Last month I walked about 30 blocks of Broadway, from 125th Street down to 92nd Street. Near 122nd Street I saw the back of a big imposing building that made me think of a school. I was right, as the structure turned out to be the Jewish Theological Seminary of America. This is the front part of the building. In case you're wondering about the artwork at the top of the entrance, here's a close-up picture. I was at the street median when I took the above pics and noticed that the 122nd street median has an arbor. Look how pretty it is! 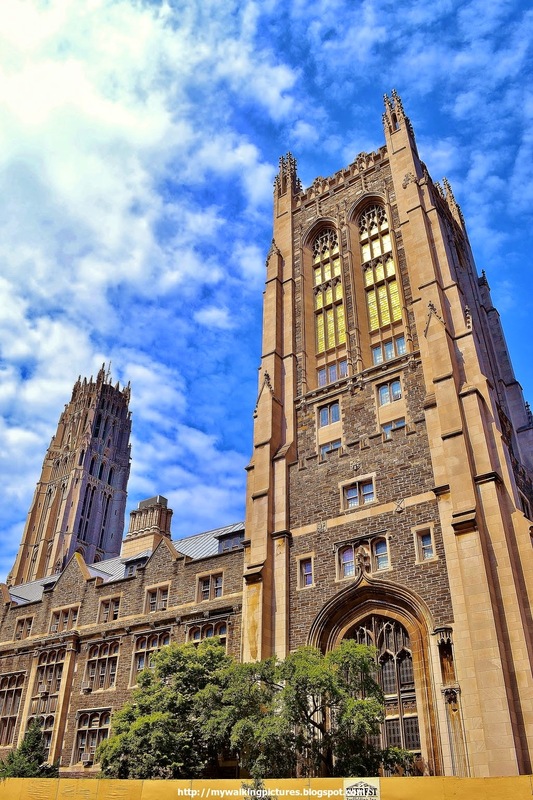 A block away from the Jewish Theological Seminary is Teachers College, the graduate school of education of Columbia University. 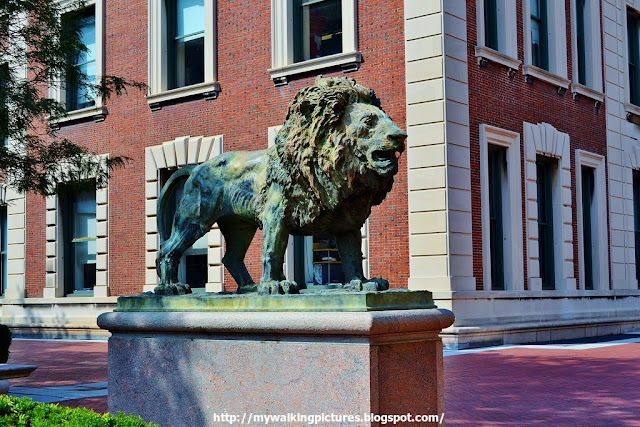 It is the largest and most comprehensive graduate school of education in the United States. The Teachers College campus consists of 5 residence halls and 8 interconnected buildings. The building along Broadway still bears the name of the Horace Mann School, after education reformer Horace Mann. 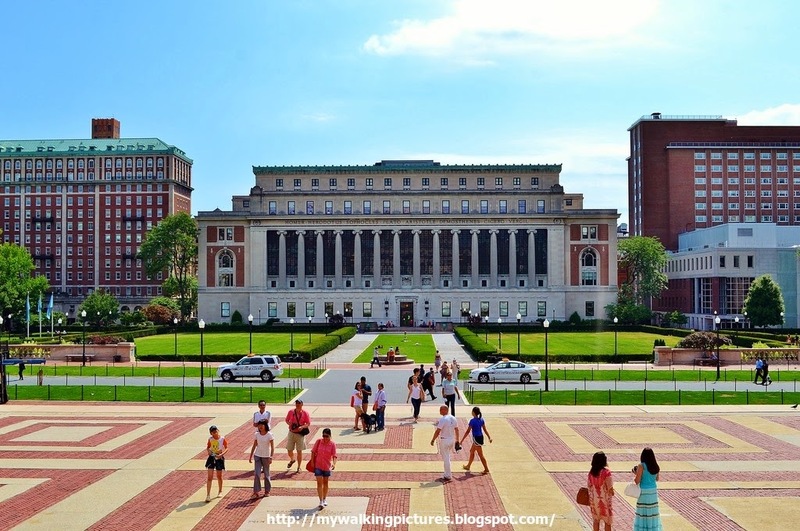 The school, however, has become independent of the Columbia University and Teachers College. On the other side of Broadway across Teachers College is the Union Theological Seminary. It's building covers two whole blocks and looking up, I can see a lot of gargoyles. Parallel to the seminary, at the next block, is Riverside Church. 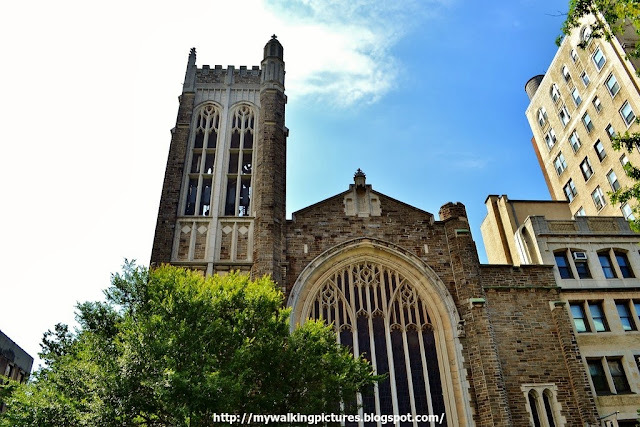 The church isn't along Broadway though, but I can see its bell tower when I looked up at the bell tower of the Union Theological Seminary. Across the seminary on 120th Street is Barnard College's Milbank Hall which consists of three interconnected buildings: Milbank, Brinckerhoff, and Fiske Halls. 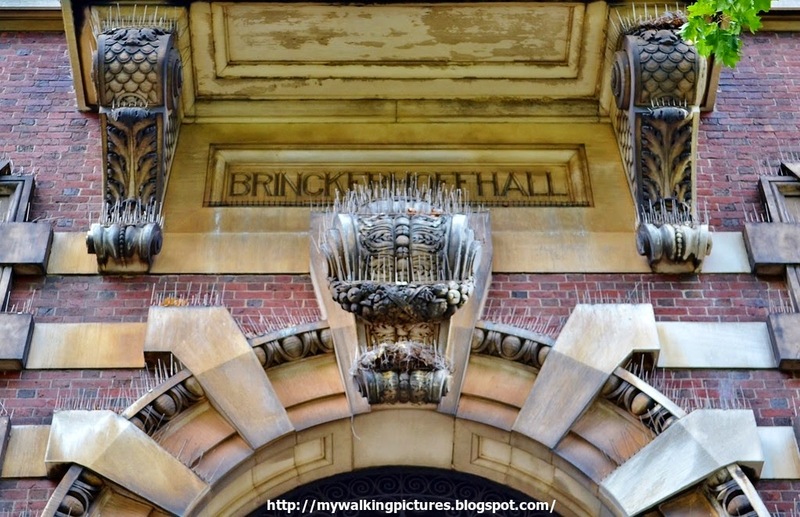 Along Broadway, there is a doorway with the words Brinckerhoff Hall. Like most New York City establishments, the horizontal surfaces of its design has bird barriers. 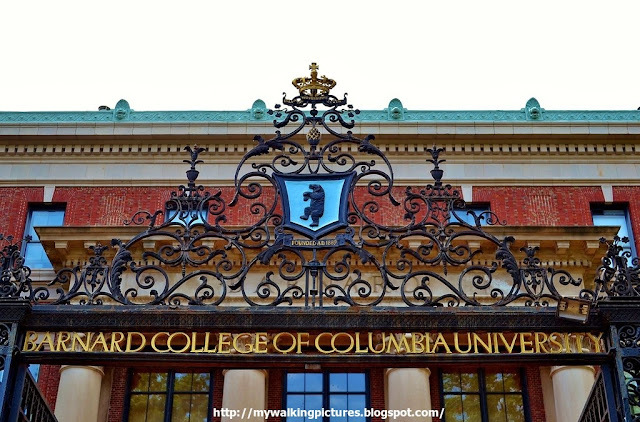 A little bit further is the main entrance to Barnard College, the design at the top of its gates shows a dancing bear. 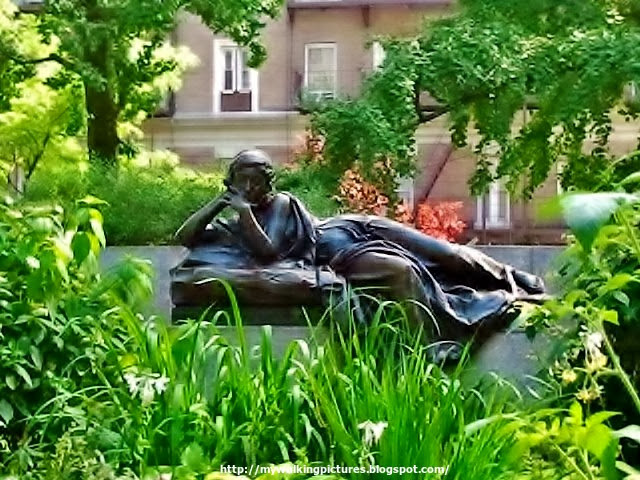 It is also the college's mascot, Millie, named after Barnard College's first president, Milicent McIntosh. On the other side of Broadway across Barnard College is Columbia University, the oldest institution of higher learning in the State of New York, occupying six blocks of Morningside Heights. 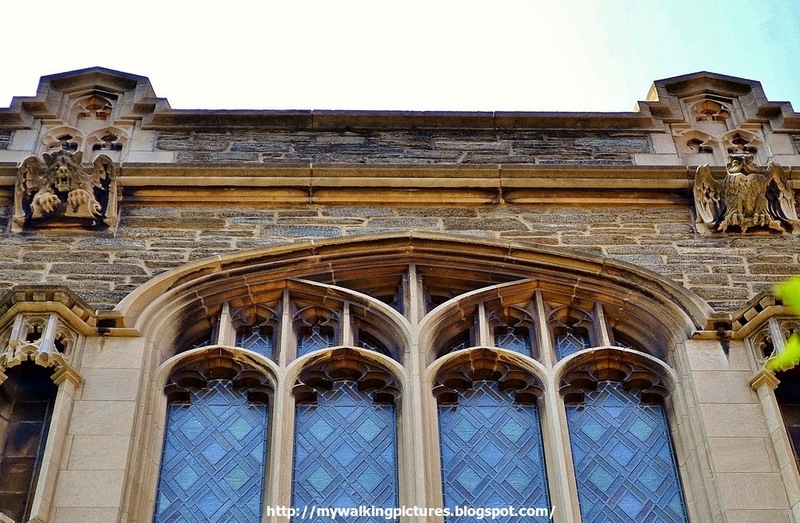 I've featured some parts of the university in a previous blog when I walked around Morningside Heights one winter day. 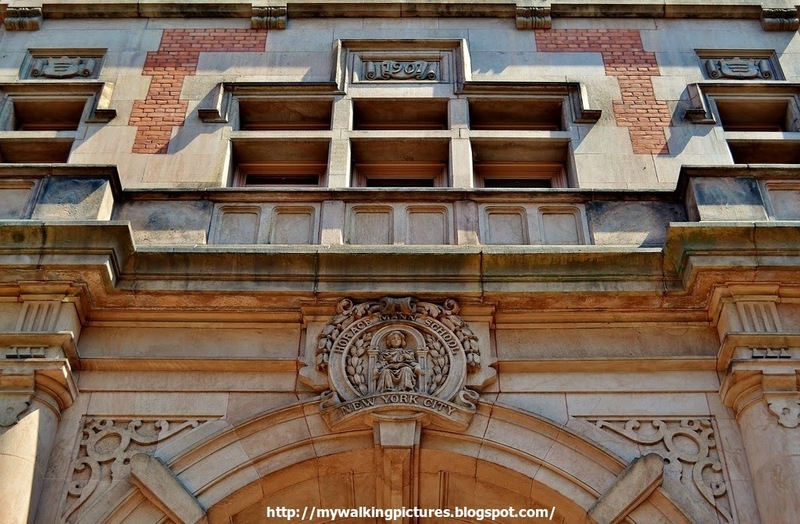 One of the university's main gates is on 116th Street, which becomes College Walk when you're inside the school campus. The south lawn is dominated by the Butler Library, the largest single library in the Columbia University Library System, which contains over 9.3 million books, and is one of the largest buildings on the Morningside Heights campus of the university. 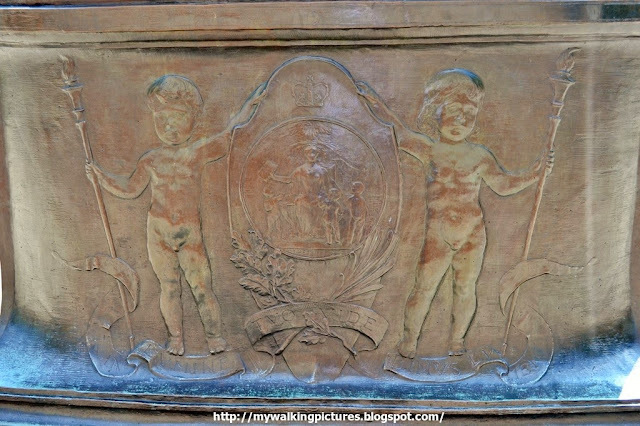 The imposing figure at the center is Alma Mater ..
Draped in an academic gown, the female figure of Alma Mater wears a crown of laurels and sits on a throne. The scroll-like arms of the throne end in lamps, representing sapientia and doctrina. A book signifying knowledge, balances on her lap, and an owl, the attribute of wisdom, is hidden in the folds of her gown. Her right hand holds a scepter composed of four sprays of wheat, terminating with a crown of King's College which refers to Columbia's origin as a Royalist institution in 1754. The back of her throne has this design. My walk in the university was limited to the northwest part of the campus as I wanted to continue with my walk along Broadway. That part of the campus has a lot of skybridges. 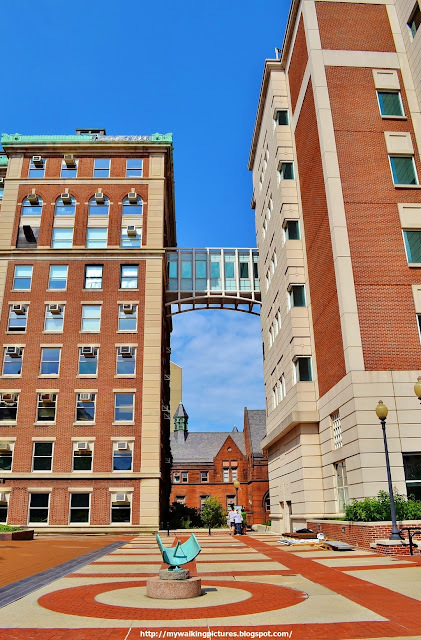 Here's one, connecting Schapiro Center on the right with Pupin Hall. I can see part of Teachers College at the bottom of the gap between the buildings. 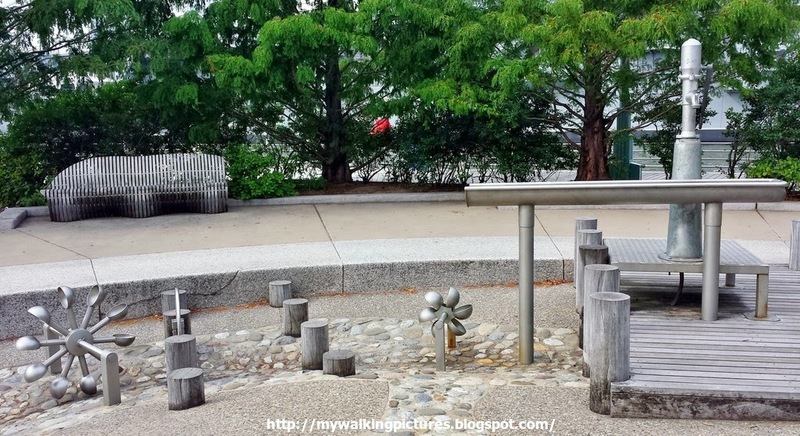 In the foreground is a sundial, it gives accurate time! I also came upon this imposing lion sculpture. Known as the Scholar's Lion, it was gifted to the university by alumnus and sculptor Greg Wyatt. 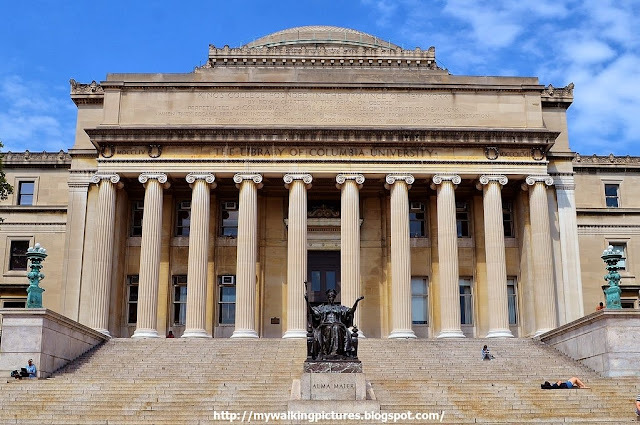 It was presented in 2004 in honor of Columbia's 250th anniversary. 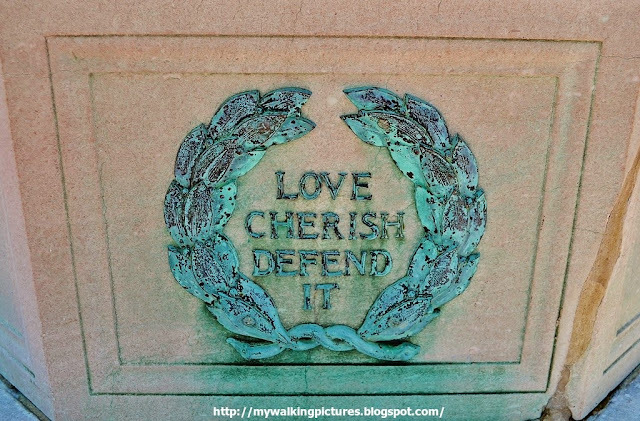 Then there is this flagpole base which I really like, just look at the words inscribed. 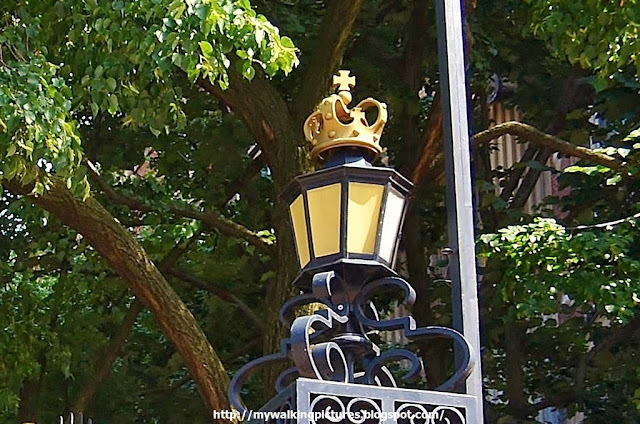 The university's main gates and posts at 116th Street has the King's Crown design at the top. Here's a close-up of one of the posts. Walking further along Broadway I saw the Broadway Presbyterian Church. 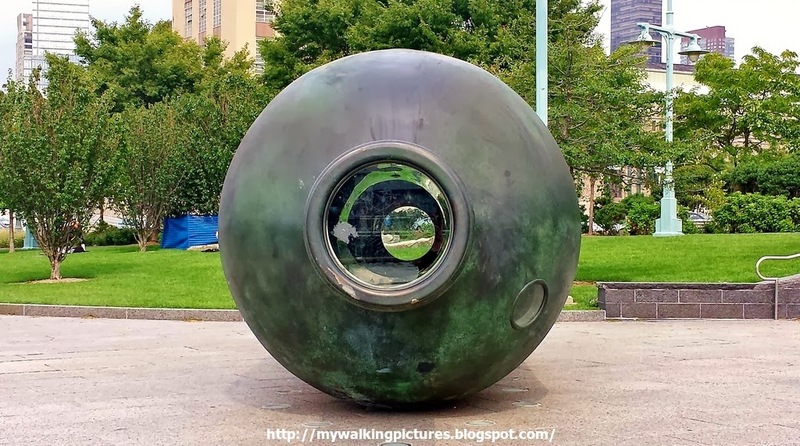 I remember it from my walk early last year when I visited all of Peter Woytuk's sculptures. 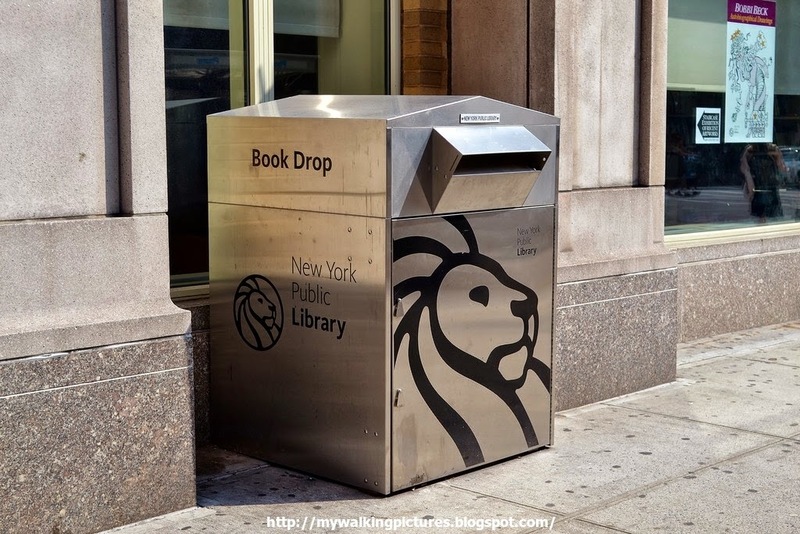 Near 113th Street I came upon a familiar sight, a lion design in a book drop box. Turned out it is the Morningside Heights branch of the New York Public Library. While crossing 112th Street, I looked east and saw the rose window of the Cathedral of St. John the Divine along Amsterdam Avenue. Broadway starts to curve at 108th Street and from here, a new street branches out. 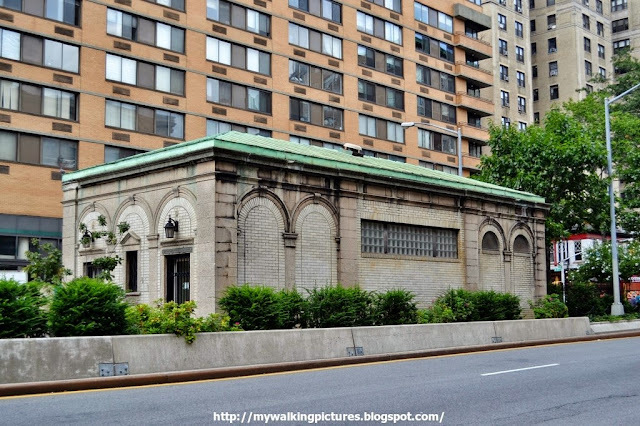 This is the start of West End Avenue which becomes 11th Avenue when it reaches 59th Street. The triangle-shaped lot formed by Broadway, West End Avenue and 106th Street is the Straus Park, named for Isidor Straus and his wife Ida, who died on April 15, 1912 when the S.S. Titanic sank on its maiden voyage from England to America. This triangle was named for the Strauses, who lived in a frame house at 2747 Broadway, near 105th Street, by the Board of Aldermen in 1912. The Straus Memorial fountain, in which the bronze figure of Memory reclines in contemplation, was dedicated on April 15, 1915. 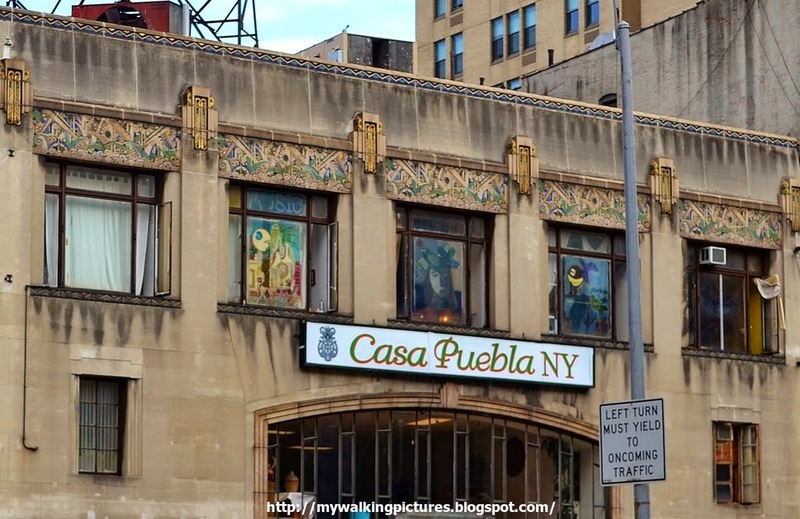 At 104th Street is Casa Puebla, a small-scale commercial structure executed in the Art Deco style. In between 100th and 99th Streets are these buildings, Ariel East, a modern high-rise, flanked by old buildings, one of which is the Metro Theater which is currently undergoing renovation to become the Alamo Drafthouse NYC. 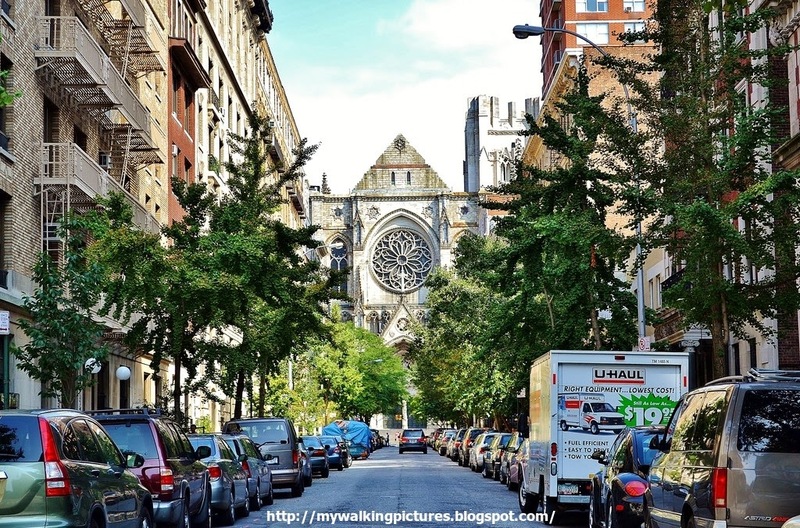 Ariel East has 360-degree views of the city which include views of Central Park and the Cathedral of St John the Divine. 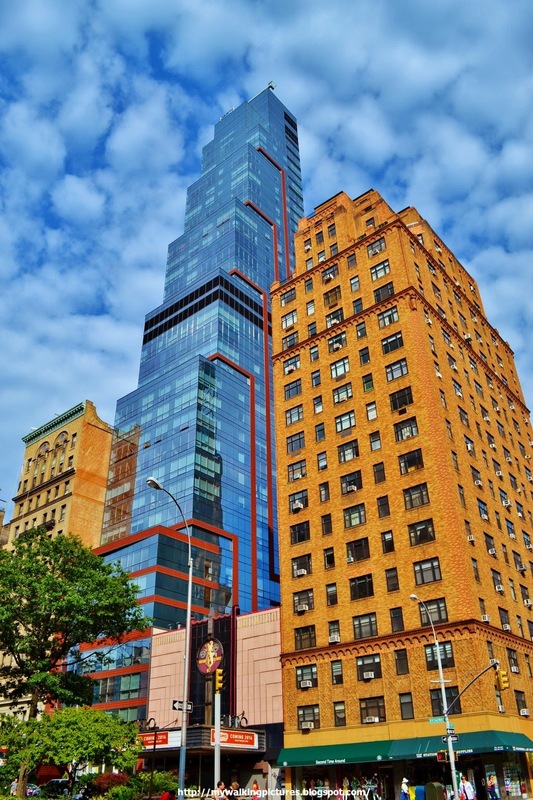 Recently its penthouse was resold, the most expensive resale deal for a condominium north of 96th Street. The owners of Ariel East bought the air rights of the buildings around it so it can soar 37 stories high. 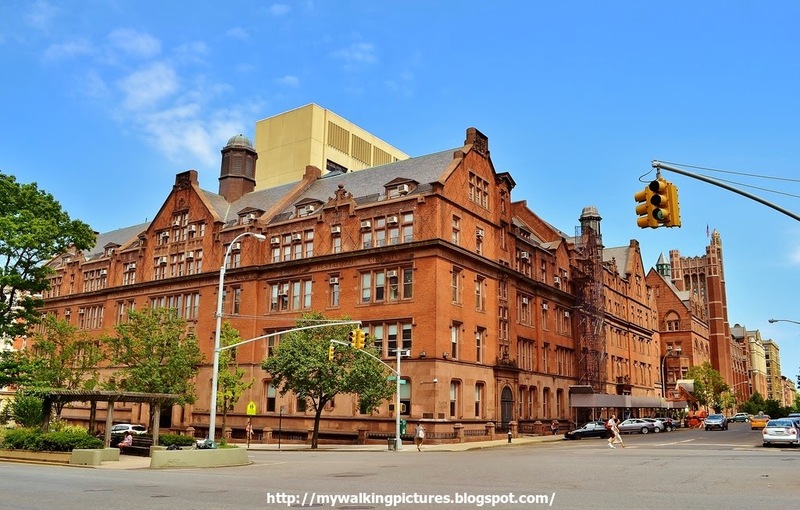 One of those who sold their air rights is St. Michael's Church which is located at the back of these buildings along Amsterdam Avenue. 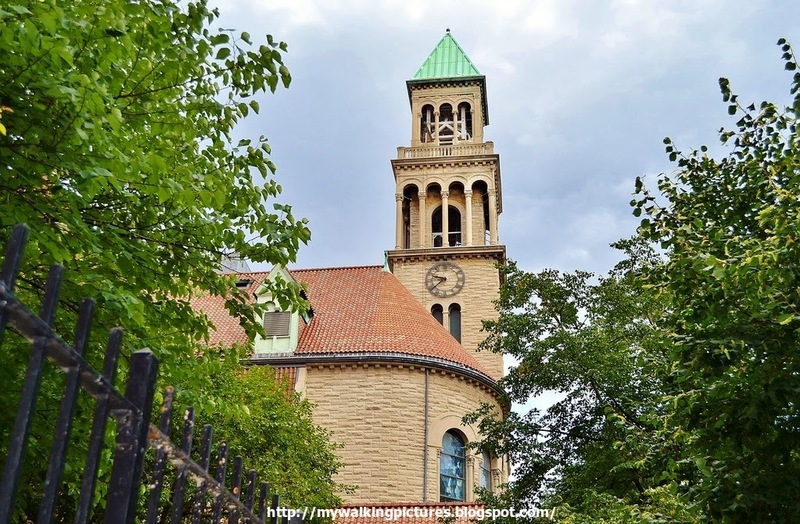 That sale allowed the church to finance a major building restoration. Looking at the corner of 99th Street and Broadway, i can see the church's bell tower. At the center of Broadway between 96th and 97th Streets is a renovated Beaux-Arts building. 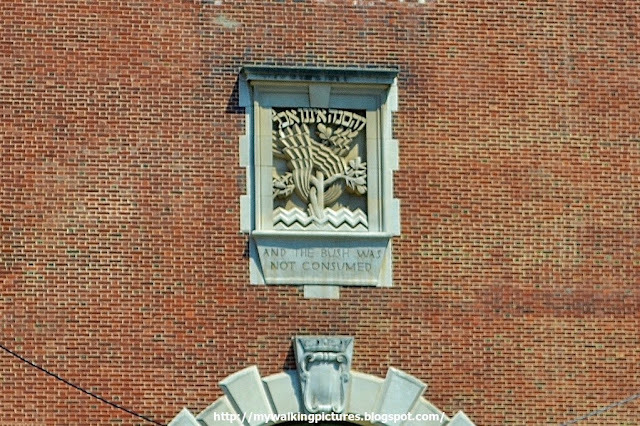 A former restroom, it is now the Broadway Mall Community Center and houses the West Side Arts Coalition which brings artists of all disciplines together through exhibitions, performances, workshops, and social gatherings. Art shows rotate every three weeks from September through early July. 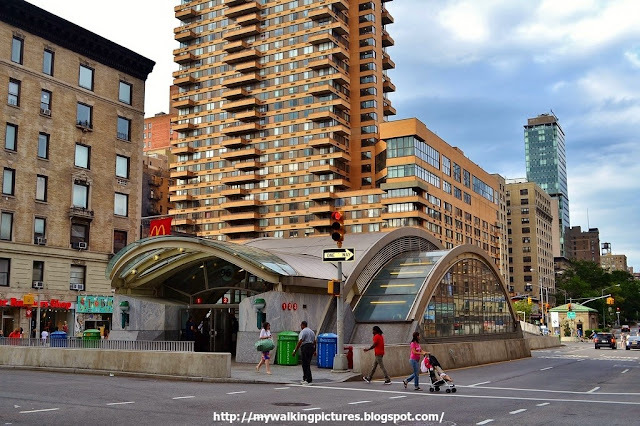 Across from this structure and also sitting at the middle of Broadway, is the 96th Street subway station which to me looks like a futuristic structure, like something from The Jetsons. And there near 92nd Street I saw Rita's Ice and treated myself to some italian ice happiness .. yummy! 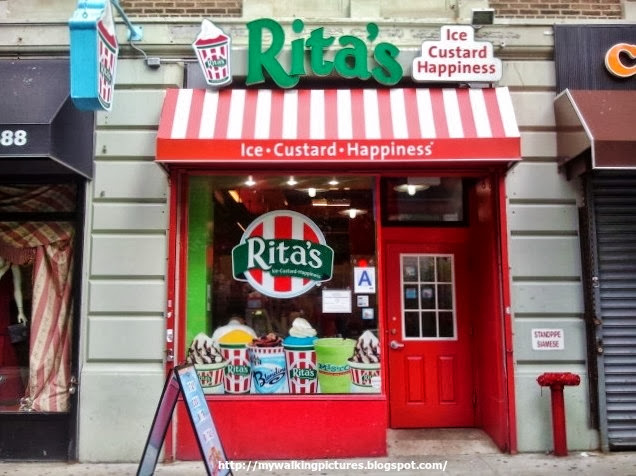 While enjoying my italian ice, I walked along 93rd Street to go to Central Park where I finished my walk for the day by walking around the reservoir. 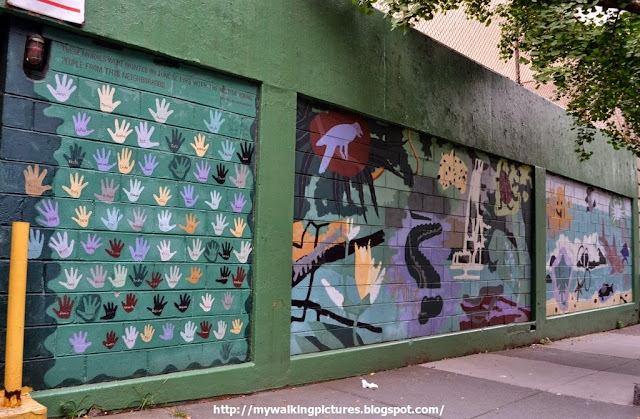 Along the way I passed by this long mural of animals but one wall stood out, it has imprints of small hands, the hands of its volunteer painters. 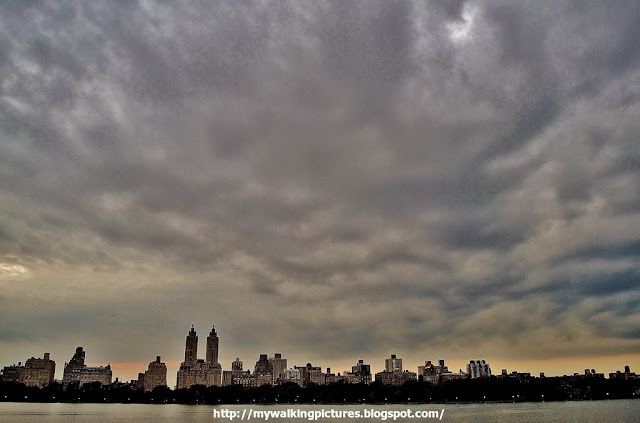 I finished this walk with a walk around the Reservoir in Central Park. The park is such a beautiful and lovely place, I always find time to walk there each week. This was one of my last shots for the day, grey clouds over the Reservoir after the sunset. Despite all the magnificent buildings and structures I saw while walking along Broadway, this made me realize that whatever wonderful creations man has made, it can never compare to nature's beauty and power.